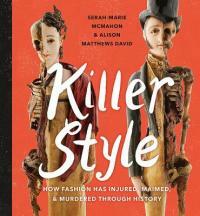 "Equal parts fab and frightening, Killer Style explores the ways in which make-up, clothing, and accessories have killed, maimed, or tormented those who wear and make them. From the story of hatters felled by mercury poisoning to tulle-burnt ballerinas to the victims of the modern craze for sandblasted denim, no one is safe from these crimes of fashion." -- Provided by publisher. Toronto : Owlkids Books, 2019.